Rent villas in Kayaköy, Turkey with private pools. Characterful three-bedroom Karatavuk Cottage is a hillside haven, surrounded by lush greenery, near Kayakoy in south west Turkey. Tucked away in the rural countryside. The Albatros Village, located in KayaKöy , offers unique and charming accommodation for those wishing for a truly peaceful and tranquil holiday. Situated in a quiet and unspoilt area . 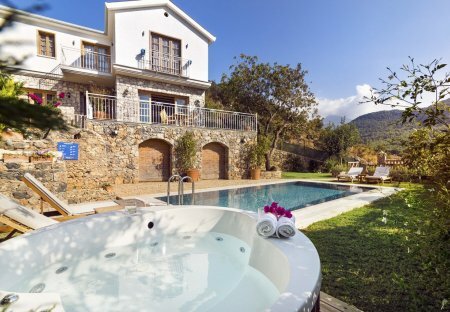 Beautiful, stone-built, four-bedroom Villa Kaya is in the historic village of Kayakoy in South-west Turkey. Setting pretty in the countryside. Three-bedroom Villa Leylak is a beautiful stone-built farmhouse, sitting high up in Kaya village with stunning views over the valley and fascinating Kayakoy ghost village. Within the idyllic mountains of peaceful Kaya village in the Southwest of Turkey, this family-friendly two-bedroom villa provides the ideal relaxing retreat. With its own private swimming pool. villa yasemin based historical, quite turkish village, surrounded vith pine forest. our villa build in 6000sq/mtr land, villa itself 450sq/mtr. privite pool and loads of siting and dining area.